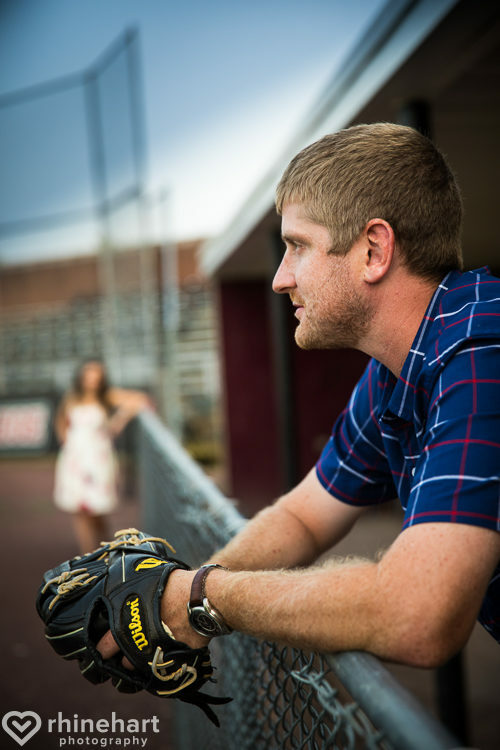 They met in Washington College, so we met at one of Chris’ favorite hang outs, the baseball field, where he was a pitcher for all four years of his WAC experience… Kristin was game and played along. 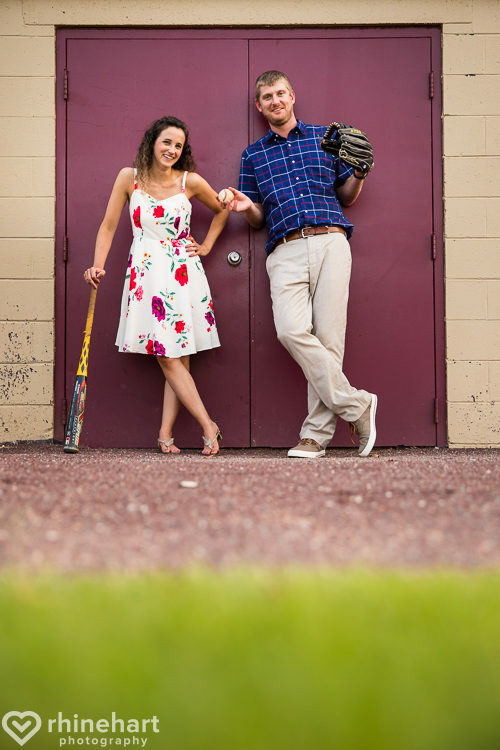 Though baseball was Chris’ sport, Kristin was super supportive and picked up a bat so Chris could re-live his glory days :D.
For this next shot I played with the shadow created in the dugout and the vibrant red wall. I thought it added contrast, visual interest and caught the sunlight perfectly, framing the couple on the far end. And this is the puddle on the tarp that was protecting the pitcher’s mound. The dark rubber and thin layer of water really brought out some crazy colors in the sky that weren’t visible to the naked eye for another hour or more! While I love to play around and get creative, I still make sure to get a few more traditional shots as well. Washington College is one of the 10th oldest colleges in the United States, a private liberal arts school formed in 1782 by George Washington himself, the first college charted after American Independence where George Washington served on the board of governors! One of the iconic buildings on campus is the Georgian style brick structure, the Eugene B Casey Academic Center. I love the golden tones of the sunlight and the soft campus in the background… you can tell that this was a walk down memory lane for them. I love to play with perspective and negative space– there is something so grounding , earthy and authentic about this image… just holding hands walking on a sidewalk in campus. High fives– so perfect for this fun, sporty couple… I may have climbed in a tree for this one, haha! These behind the scenes shots were my fav– I had Kristin pull out her skirt for a shot and Chris ‘pulled his out’ too. He was constantly playful, in motion, just a joy to be around. These two were always laughing and loving. Now it was finally Kristin’s turn for her sport– field hockey! Haaa, playing a bit more with perspective here as Kristin levitates and Chris is impressed and stoic, lol! So I pushed every setting possible in my camera to pull out every vibrant color in the sunset. It is pushed to the max and my artistic interpretation for this extremely colorful, fun, couple. Can you feel the love tonight ;)? Then they had a thumb war– so them! Chris and Kristin, thank you for choosing me to capture your personalities, love and this extremely special location and time in your relationship! You guys gave me so much to work with because you were playful, fun and so comfortable in your own skin, and with each other. You were loving, appreciative, effectionate and embracing of your quirks and each other’s. Also, no matter how silly or crazy my ideas were you were up for trying them and able to be yourselves anywhere. To say I loved working with you two is an understatement. I hope that these are just the sort of colorful, playful, fun, authentic photos that you were hoping for!